The elegant design looks like watercolor on silvery silk. 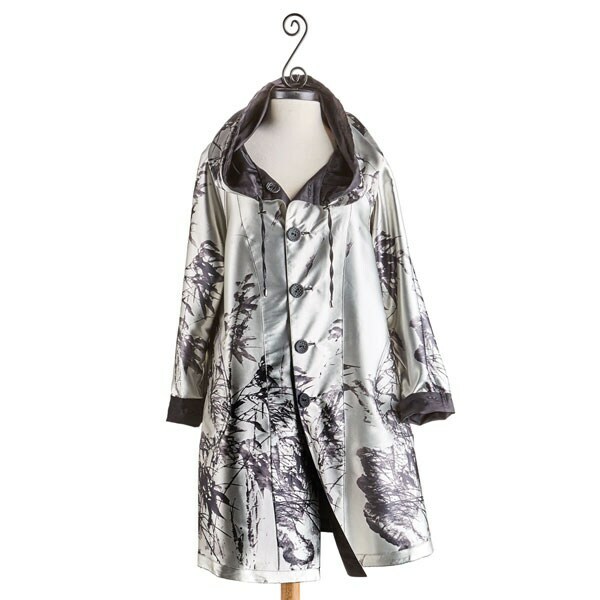 Lightweight, packable coat has raglan sleeves with adjustable buttons at the cuffs, on-seam patch pockets (both sides), double buttons down the front, easy A-line shape, and beautifully finished seams. Pinch toggles on the drawstrings let you ruche the oversized hood. Reverses to solid black. Water-resistant polyspandex. Sizes S(6-8), M(10-12), L(14-16), XL(18), 1X(20), 2X(22). Hangs 38". Machine wash. Imported.